Are you a BA or BSc student in Psychology and are you interested in further developing your research skills? Then the Research Master in Psychology may be the programme for you. Within this programme you can choose the specialisation Developmental Psychology, which will allow you to perform your own research in one of many areas: cognitive development, autism, social anxiety, juvenile delinquency, or social-emotional development, to name a few. Click here for more information about the programme, or contact Carolien Rieffe. Which children can regulate their anger well while losing a game? Which children can hide their emotions strategically, or even better, can lower the level or arousal, when that helps to obtain their goals? This project aims to develop computer based tasks to examine children’s capacities for emotion regulation. However, this implies that we first need to anger these children! This is so-called “emotion induction”. This project is aimed at children between 9 – 13 years old, and besides in vivo tasks, data will also be obtained through self-report and observations. Social-emotional development of 9-15 year old hearing-impaired, autistic and typically developing children. Emotions play an important role in our daily lives. However, hearing-impaired children and children with ASD, who have less access to the social world, seem to experience difficulties in their social-emotional development more often than typically developing children. In a longitudinal research project the development of these three groups have been assessed, but data collection with the typically developing group is still ongoing. Students will help with the data collection for this group. For their thesis, students will have access to the data collected with the clinical groups, in order to describe the (longitudinal) development of various aspects of emotional functioning for children with different backgrounds. Banyu was a Indonesian student on the Master programme of Child and Adolescents Psychology, who graduated October, 2016. For his master thesis, Banyu participated in Naqi’s project, examining cultural differences in emotion regulation between Eastern Asian and Western European cultures, e.g. Malaysia and the Netherlands. Good job, Banyu! Hapsari Cinantya was a master student from Indonesia who graduated in 2015. 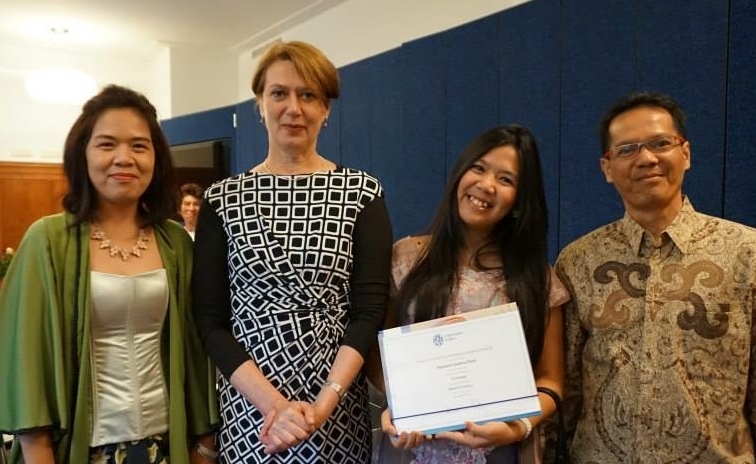 In her research project, supervised by Dr. Sheida Novin (Utrecht University) and Carolien, she investigated social anxiety and behavioral problems in Indonesian adolescents. Currently, she is working at an New Zealand-based international school in Jakarta. The school is an inclusive school and she is part of the special needs education team, assisting young children with learning problems. We are all very glad to hear that she is enjoying the job. Good luck, Hapsari!